Stack is a very common name in Co.Kerry. Search graveyards in and near Listowel. 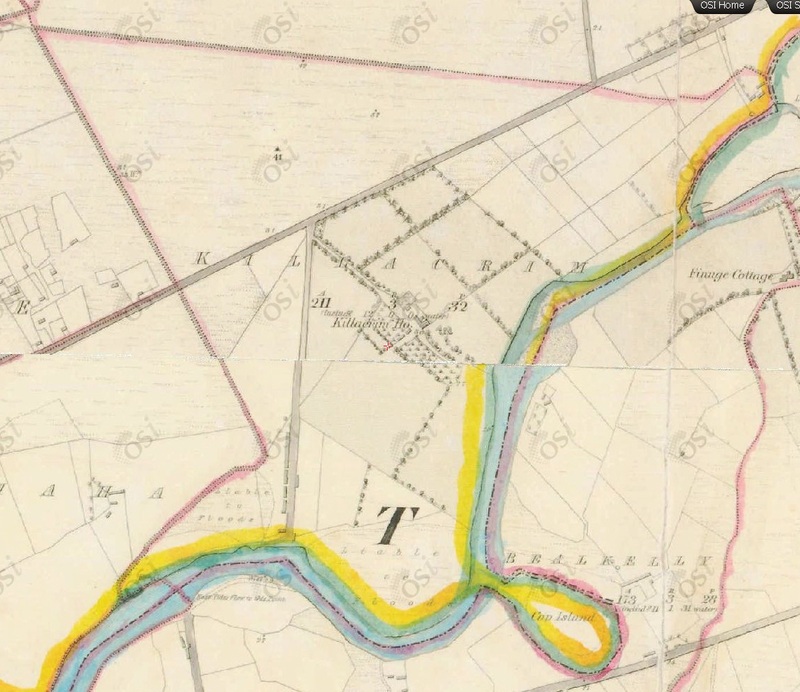 Greenville, W of Listowel, on 1829 to 1842 map. Kilcreen is just visible to the E side. He mar 17 Jan 1860 [Listowel RC par records] to Catharine Moore [or Catherine, born 1828 or 1831, Co.Kerry]. Mar wit by Ellen Moore and Denis Dillane. She (not he) was of Greenville, W side of Listowel. See 1829 to 1842 map. 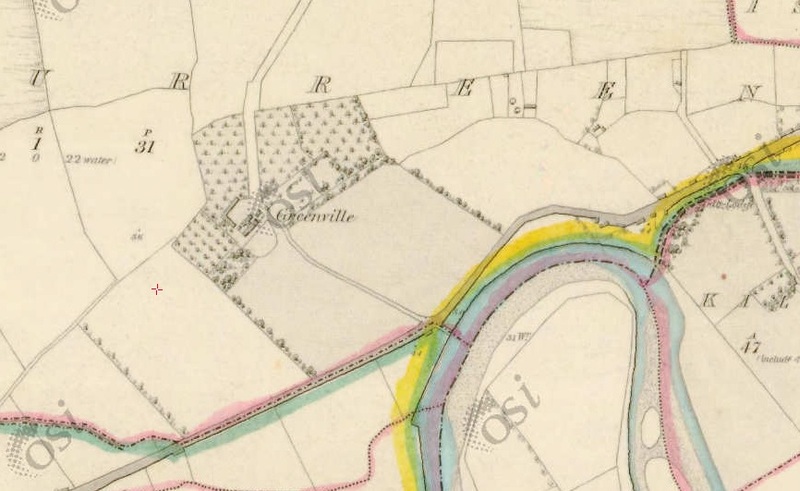 Greenville House was a large house in Gortcurreen townland, which belonged to the Sandes family. See [Houses of Kerry]. Moore (and later Stack) may have worked on the estate. See modern street view of S entrance. Thomas is listed as of Listowel at children's bapts 1861-64. 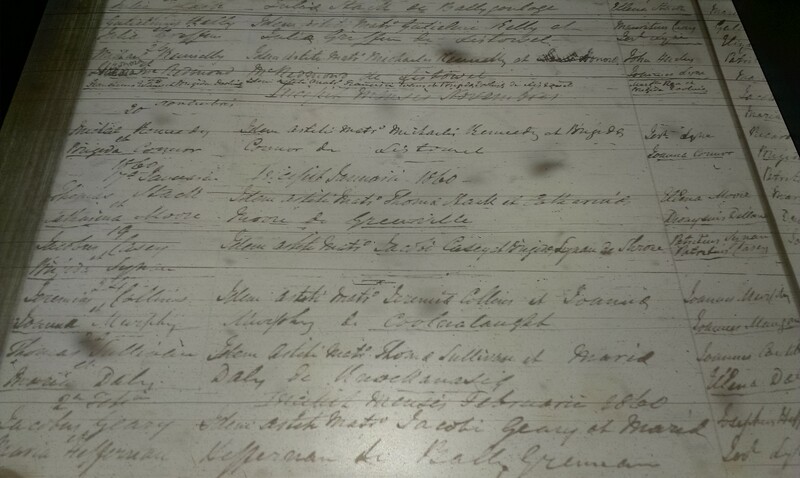 At son's bapt 1867 and son's birth 1871 [GROI] they are listed as of Kilcreen, W side of Listowel. See 1829 to 1842 map. This is the townland bordering Gortcurreen, to the SE side of Greenville. There is a large house, Kilcreen Cottage, in Kilcreen townland. See [Houses of Kerry]. "Greenville" and "Kilcreen" in records may refer to the same place. They are listed as of "Greenville" at son's bapt 1871. He is listed as "herdsman" at son's birth 1871 [GROI]. He is listed as "farmer" at son's mar 1896. At some point they moved to Killacrim (or Killocrim), some distance further to the SW of Listowel. See 1829 to 1842 map. See modern map. There is a large house, Killacrim House, in Killacrim townland. See [Houses of Kerry]. Their dau is listed as of Ennismore (which is the district containing Killacrim) at mar 1900. They are listed at Killacrim in [Census, 1901]. She is age 70 (born 1831). He is agricultural labourer. They can both read and write. He or his son must be the "Tom of Killocrim" branch listed in [King] in the early 1900s. Thomas died 1901 to 1911. He is probably not Thomas Stack who died Listowel, 2nd qr 1904 [GROI]. He is probably not Thomas Stack who died Ballylongford, 2nd qr 1907 [GROI]. Catharine is listed at Killacrim in [Census, 1911]. She is widow, age 83 (born 1828). She is probably not Catherine Stack, widow of farmer, who died 29 July 1916, age 90 (born 1826), at Woodford, SE side of Listowel (see map). See death in [GROI]. Death registered by Pat Stack of Listowel. can't identify him in [Census, 1911], he is alive but not living with mother. bapt 30 March 1901 [Ballybunion RC par records]. Catherine Mahony, born 1906, Co.Kerry. Martin Mahony, born 1907, Co.Kerry. 2 other children, Mahony, died pre-1911. living at Killacrim with mother in [Census, 1911], he is listed as agricultural labourer, single. [Notes of Nora Stack] said born 2 Apr 1871, this may be true, or may be confusion with bapt. Entrance (from S) to Greenville House. 2011 screenshot from street view. The marriage of Thomas Stack to Catharine Moore of Greenville, near Listowel, 1860. Baptism of William Stack, 2 Apr 1871, [Listowel RC par records]. Killacrim, further SW of Listowel. sp bapt of Michael, 1861.
she was illiterate (signed with a mark), wonder if this is just his 7 year old sister. Garrett Stack of Dromclogh, Ennismore district in 1901 census. James Stack of Killacrim in 1911 census. James Stack of Killocrim (died 1957) and family are bur in Listowel Cemetery. listed at Gortcurreen in 1911 census. bapt 7 November 1824 [Listowel RC par records]. sp Patrick Mahony's bapt 1901.
born 1779, family home and shop, 12 Aungier St, Dublin.